Yeah, But Can She Type? 14" x 36" x 36"
This piece was made for a client as a place to empty one's pockets of keys, change, etc on top of a half-wall in a front entry stairwell. The rails are from a tree felled on the clients' property, then steam-bent to make the sweeping curve. 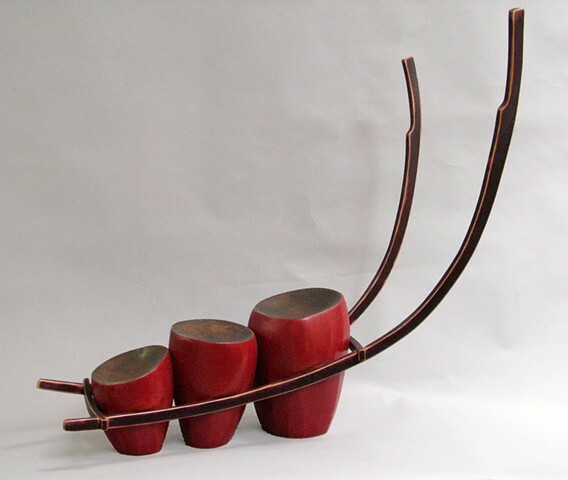 The barrel or drum-like individual trays are made by coopering Mahogany, and overlaying the tops with formed and nailed bronze to create this sled or sleigh-like tray.